Ronja Storm’s hull has arrived at the Havyard yard in Leirvik, ready to become the biggest wellboat in the world. No other ship in the world has a freshwater production facility as large as that of Ronja Storm. The boat can produce 16.8 million liters of freshwater a day. Design & Solution. “The focus has been handle the ? sh. To ensure ? sh welfare and on thorough and reliable handling of large survival, robust and redundant systems amounts of ? sh, which has required new are also incorporated. 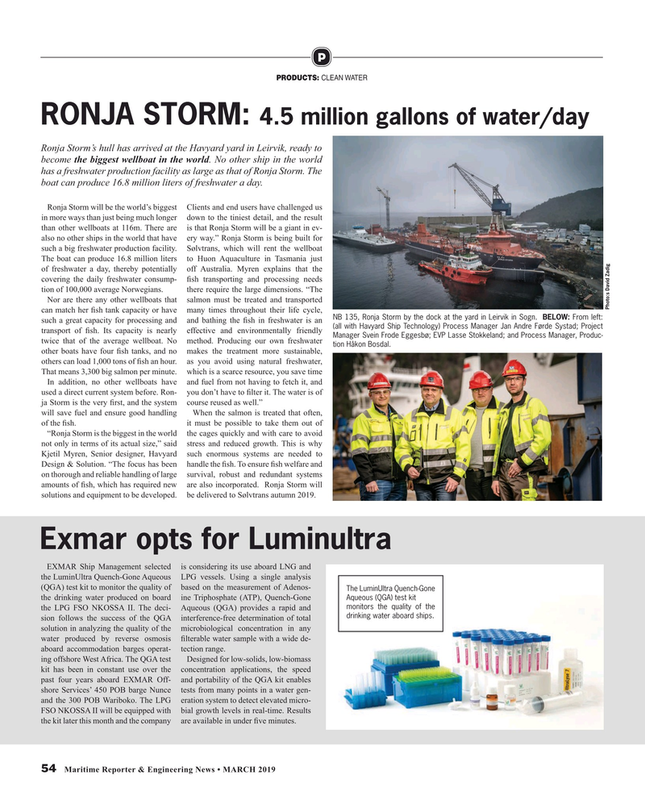 Ronja Storm will solutions and equipment to be developed. be delivered to Sølvtrans autumn 2019. Aqueous (QGA) test kit monitors the quality of the the LPG FSO NKOSSA II. The deci- Aqueous (QGA) provides a rapid and drinking water aboard ships.